This feels like the hundredth time that Jack Lemmon and Walter Matthau have appeared in a movie together, and there is a reason why they do. Everything that is good about Grumpy Old Men is that way because of their chemistry together. The reason they are able to believably play friends who have known each other for 50 years is because they have literally known each other for that long. 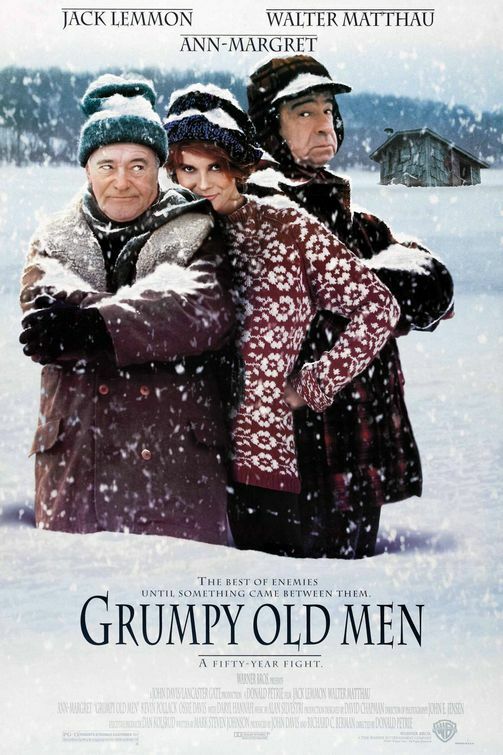 Grumpy Old Men is the story of retired single friends, John Gustafson (Lemmon) and his next door neighbour Max Goldman (Matthau), they live in the sleepy frozen town of Wabasha, Minnesota where they spend most of their time arguing with each other or ice fishing. They have been friendly for years, despite the odd disagreement, but that friendship is put to the test when a hot Californian free spirit (Anne Margaret) moves in down the street. Both are attracted to her and feel the other should step aside so they can pounce. The two fight for her affections, while John is also dealing with his daughter’s (Daryl Hannah) potential divorce from Shooter McGavin, and the fact he has a crap load of back taxes he owes the government. Like I said, nearly everything that is good about this film is that way because of the performances of Jack Lemmon and Walter Matthau. The scenes where they bicker with each other seem so real, because I’m sure a similar conversation was being had between the two right before the scene was shot. It is rare that two actors will have this good chemistry with each other and should be enjoyed when you stumble upon it. Another of the film’s highlights for me was Burgess Meredith as Lemmon’s crude father. He steals nearly every scene he is in with his dirty lines and encouragement for his son to bone the new neighbour. Grumpy Old Men is a sweet, very funny film, with a lot of heart about the demographic of older retired people, which are rarely given an entire movie to themselves. The performances from this solid and experienced cast are all really good, especially Matthau and Lemmon. They make you believe they have been friends for years, which is probably because they really have been. A few years before he died, my grandfather commented on how he had to look after all the “widow women” on his street. Three of he and my grandmother’s neighbors had lost their husbands, and he felt somewhat responsible for them being the oldest male resident of the neighborhood. It didn’t matter that at almost 90 years of age he was less fit than at least two of these ladies, and in reality, if anyone was helping out the neighbors it was my uncle. Still, my grandfather felt it was his duty as unofficial patriarch of the street, so he spent a good portion of his day monitoring the comings and goings in the neighborhood from his front window. I say all this to point out that statistically, this movie should be titled Grumpy Old Women, and feature two elderly ladies vying for the attention of some “young” stud who has moved into the neighborhood. But I guess the world had already been blessed with The Golden Girls, so it was the old guys’ time to shine. Plus, we all needed to be reminded just how hot Ann-Margaret still was (is!). Grumpy Old Men succeeds purely because the cast is so fantastic. The storyline itself is a tad stale, and simply making the characters retirees doesn’t make it fresh (Though in itself this is refreshing. How often do actors over 60 get to be the stars of a movie?). However, Jack Lemmon, Walter Matthau, and Ann-Margaret are just so delightful to watch that this hardly matters. Lemmon and Matthau’s chemistry is especially undeniable. I’ve never seen the previous five films they starred together in, but it’s clear here that they are old friends who enjoy working together. This is so important, because their characters have supposedly known each other for fifty years. You get a real sense of history between these two, and it’s easy to believe that they are old rivals. This is really just a feel good kind of movie. There’s nothing too heavy or objectionable about the plot, the characters are fun and feel like they have a real history together, and there’s as much heart as there are slapstick gags. Plus, you get a fun bloopers reel over the credits, featuring Burgess Meredith making a lot of innuendo laced jokes. So, lots of win all around!